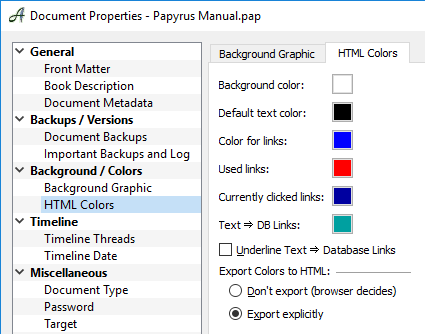 Papyrus Wiki Layout Colors for Documents, Text, Graphic Objects, Etc. 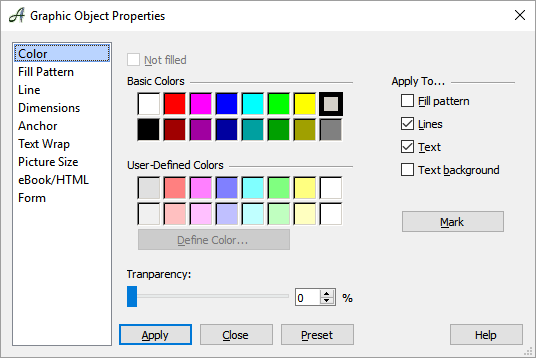 In the “Color” dialog (under “Text” menu) you can set either a basic color, or a user-defined color for a variety of graphic objects, and text including: all monochrome graphic objects, fill patterns, lines, selected blocks of text, and the text where you cursor is currently placed. Using the checkboxes on the right side of the dialog, you can decide which color you would like to apply to the fill pattern, lines, text, or for the text background. Colors will be applied with the selected checkboxes when you hit . With you can find/locate text with a specific color in your document and select these areas as a block. 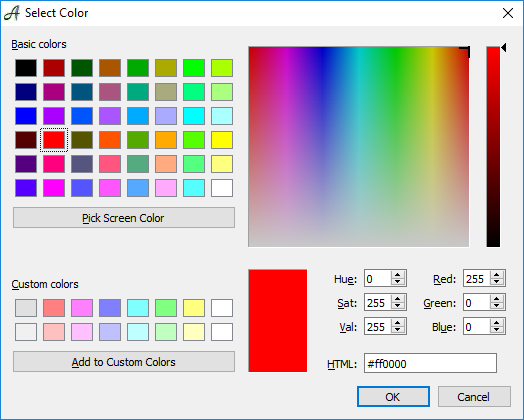 The “Define Color” button will open a dialog, in which you can choose a basic preset color or define a color of your own. If you want to change the settings for a graphic object in this dialog, you will first need to activate it by clicking on it. Here you can choose a basic color in the color square (WIN), adjust the brightness for the end result, and see the colors selected for Red, Green and Blue (they can also be entered here). Options and modification possibilities depend on your operating system / computer. If you find it easier to read, you can change the background color to something darker and use another color for the running text. You can also decide in this dialog whether you would like to “ Underline Links”.